Furthest Point South | Shackleton. Shackleton’s attempt to reach the South Pole from the Nimrod Expedition. The party reached what he called his “Furthest Point South,” 88º 23 S. 162º E.; 97.5 nautical miles from the South Pole. This was the furthest point south reached by anyone at that time. 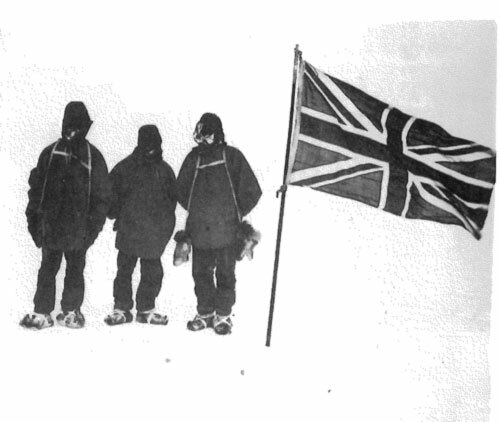 They planted the flag and left a box of Shackleton’s Antarctic stamps, then turned around for the return to base. Left to right: Adams, Wild, and Shackleton (photo taken by Marshall).